Add Sass to your Glass! Finally... I started a page! Honeymoon in Greece courtesy of J.Crew!! "All the single Ladies"... and Men! Choose a color of Luster Dust, an edible yet flavorless powder that comes in 20 shades. Add a pinch of the powder to each drink, stir, and viola -- your drinks will have a beautiful iridescent sparkle. And from a girls night in at my girlfriends' place.... the Passion Fruit Tropical Martini. I must say it was rather tasty! Lots of texture adorned the desert table. A twig runner,rose petals,river rocks, and fresh greenery wrapped with pink satin ribbon for a touch of whimsy,adorned the sweet treat table. Each guest went home with a personalized face cloth. Hand written terms of endearment on riverrocks were used in the guest words of wisdom to the Bride to be. And a terry sachet pillow containing various scents of simmering potpourri. This bridal shower was a labor of love for me. It was for my cousin, I am also her Matron of Honor. I wanted to create her very own oasis, where she can get away from her wedding stress for just one day(maybe a few hours). I incorporated lots of texture, light music, soft fragrance, and lots of candles to create the serene scene. I prepared a special chair for the guest of honor, covered with a plush terry towel, and embroidered with her initials. I asked the Mother of the Bride (to be) to make plush terry runners for the guest tables. Sign in book, also housed words of wisdom from her guest. Candle centerpiece was placed on top of a twig mat with petals, and river rocks. Menu also served as a game booklet, tied with beargrass used in the centerpiece. Please stay tuned! Blogger is taking forever and a day to upload my pics. More details to come! Our destination bride relaxed and released her wedding planning stress at her Oasis Shower this weekend. Please become a Fête Fan! 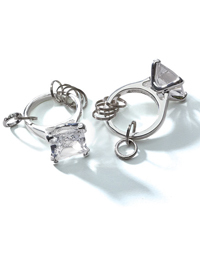 Don't you just love things that bling? I fell in love with this invitation from an Etsy seller. You gotta love this Napkin Ring! I know Valentines Day is over, but shouldn't it we celebrate it everyday? 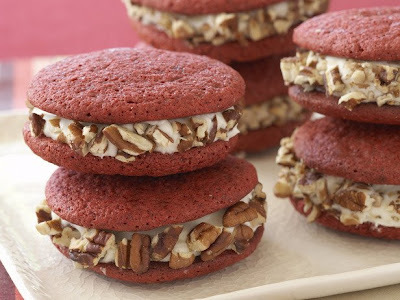 OK, one last thing.... Have you ever thought about other ways to indulge in Red Velvet cake, besides cupcakes? Check this out, I came across this recipe in my "must try recipe files" and had to share it! I love me some Paula Dean! While you are at it, checkout their chic new styles. Head over to J.Crew for more beautiful gowns. Don't get yourself down on Valentines Day. Get your single friends together and have an Anti-Valentines Day Singles party. Tell your single friends to bring along one of their single friends, male or female, their friend can also bring a single friend and so on and so fourth. Just make sure there's enough room for " all the singles ladies"... and men. You never know if there will be a love connection at your Anti-Valentines Day Singles Party! Have fun! OMG, it's beautiful out in the Northeast. I'm feeling Spring coming on! The sun is even setting after 5pm now whoo-hooo! So, keeping in mind the warn weather and leaves growing back on our trees,how about giving your table a fresh new look for Spring? Check out how great these green vases look without flowers. For an economical alternative to flowers, fill them with greenery instead! These cute little bud vases are really pretty without the buds.. Looks more like fresh herbs to me. I know you want to try one. Please do indulge! 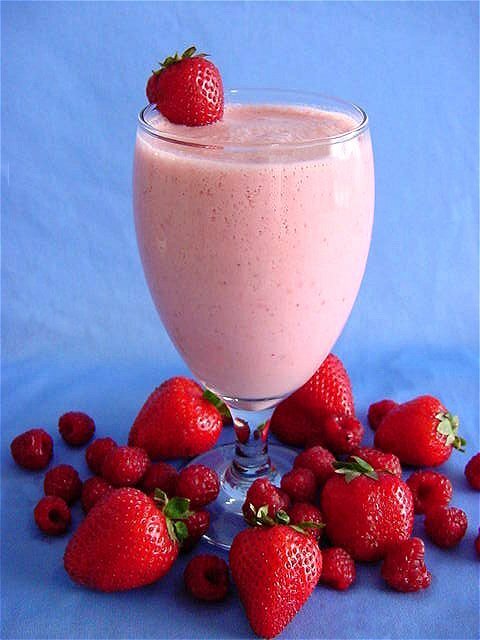 1Place all ingredients in a blender and blend until smooth. 2If you want you can freeze the yoghurt before using. 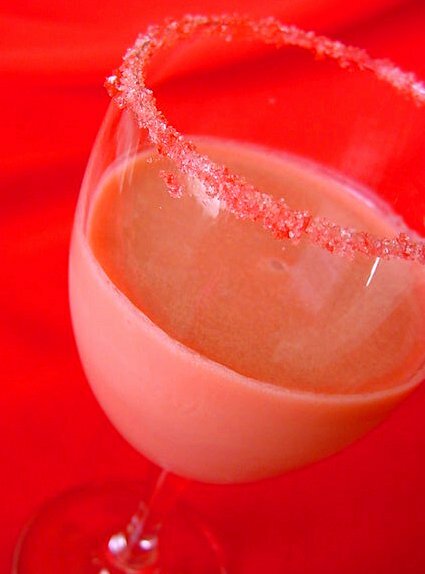 2Add Vodka, chocolate liqueur, cherry liqueur and cream. 3Shake and strain into a chilled cocktail glass. The invitations are in circulation! It's almost time for our destination bride to take a much needed break from planning and relax relate and release with her friends and family. 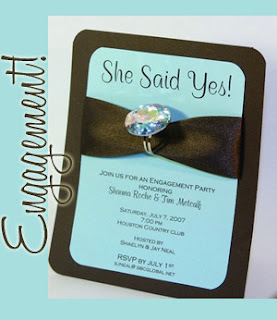 Here is the invitation that will set the serene scene for her bridal shower. 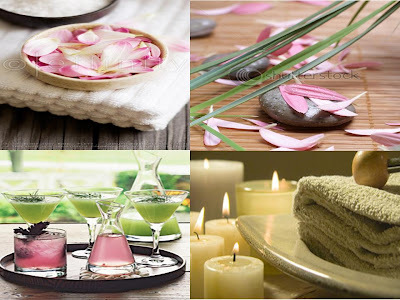 Lots of candles will take center stage and set the soothing mood. I know you ladies love to shop, who doesn't!? 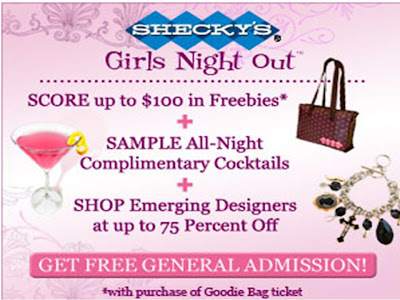 Sip and Shop" at Shecky's Girls Night Out! Check out the link to see when Shecky's will be in a city near you! Happy Shopping! 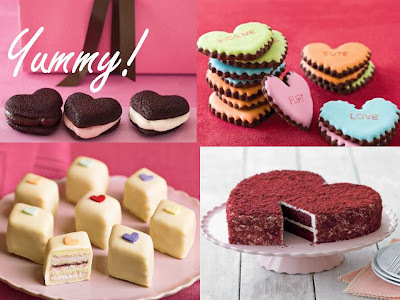 Give your sweetheart a sweet treat for Valentines Day. They'll love you even more for it! 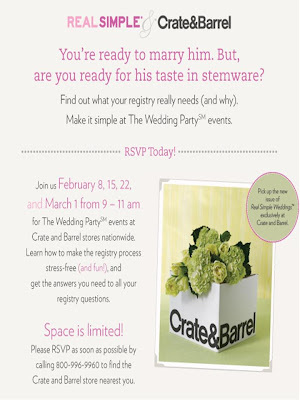 Two hours of food, drinks, music, and expert advice on registering. Not every store is hosting a Wedding Party, so contact a store near you for information and reservations. This inspiration is for a bride who's planning a destination wedding. She's a bit overwelmed, so to ease her stress for one day, we will create an intimate calming atmostphere for her to relax, relate and release with friends and family. Her bridal shower will be held at a restaurant, so we'll bring in various textures and spa like elements to the space.